Our limited edition offers a wide range of functions, ultimate ease in handling and a specially designed faceplate that makes sewing a golden experience. A reason to celebrate! With purchase of the B 530 LE Gold, receive a 125th Anniversary Presser Foot #1 for free. Coated with 24K gold, the special edition Reverse Pattern Foot #1 is an optional accessory packaged in a beautiful commemorative tin complete with a golden spool of Mettler Thread. Metallic Golden Mettler Thread: Add beautiful golden stitches to your favorite projects. Commemorative Tin: Store your golden foot within the golden keepsake. The BERNINA 530 saves the set length and automatically repeats it with each successive buttonhole, as many times as you wish. Thanks to the Extensive stitch library you will find the perfect stitch for every occasion. 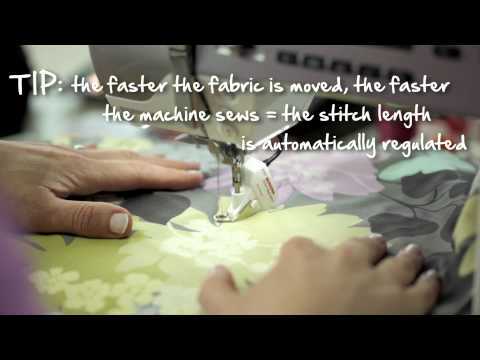 Enjoy quick access to all stitch patterns and settings. The BERNINA Stitch Regulator is available as optional accessory and guarantees precise stitch quality and results at any speed during free-motion quilting. * This BERNINA presser foot is coated with 24-carat gold. Gold is a soft precious metal, and therefore signs of abrasion can and likely will occur in the ordinary use of this product. The functionality of this product will not be affected by these abrasions. BERNINA MAKES NO REPRESENTATIONS OR WARRANTIES WHATSOEVER WITH RESPECT TO THE OVERALL APPEARANCE OF THE PRESSER FOOT, AND DISCLAIMS ANY LIABILITY RELATED THERETO, INCLUDING WITHOUT LIMITATION FOR SIGNS OF ABRASIONS AND ORDINARY WEAR AND TEAR.